The old writers can be difficult to read, but even so they make use of language in ways virtually unknown to the last few centuries. The unusual word choices drive the meaning home in a profound way. To what extent have you traded the imperishable pleasures of knowing God in Christ for the gross and muddy pleasures of sense? That, friends, is an awful trade. This entry was posted in Uncategorized on November 19, 2015 by Jason Dohm. It is just five weeks until the upcoming National Center of Family-Integrated Churches “Highway of Holiness” conference, October 29-31 at Ridgecrest in Asheville, NC, and I am already looking forward to it. In a day where sanctification is the subject of considerable controversy in the church, J.C. Ryle’s classic, “Holiness,” is an enormously helpful treasure. Ryle carefully considers and then refutes the two great errors regarding the doctrine of sanctification: blurring the lines between justification and sanctification, and isolating them from one another. Blurring the lines welcomes legalism and erodes justification by grace alone through faith alone. Isolating one from the other invites false assurance and an environment of compromise. By keeping justification and sanctification rigidly distinct yet unbreakably connected, Ryle gives us the biblical doctrine of holiness, without which no one will see the Lord. Friends, don’t come for a book report. While the book will be profiled and summarized, Ryle puts forth a robust doctrine of holiness, ill suited for a lecture but perfectly suited for earnest preaching. This entry was posted in J.C. Ryle, National Center for Family-Integrated Churches and tagged "Highway of Holiness", J.C. Ryle, National Center of Family-Integrated Churches, ncfic on September 22, 2015 by Jason Dohm. At the very end of July 2013, I posted “That Will Never Be Marriage” and promised to republish it annually for five years. This is now year three. This entry was posted in Marriage and tagged gay marriage, marriage, the Bible on marriage on August 25, 2015 by Jason Dohm. On an average week, this represents 1 hour of work. For those keeping track, that brings my total time to prepare a sermon to a range of 11-15 hours. This entry was posted in Preaching on August 21, 2015 by Jason Dohm. I write the sermon with an open Bible and a keyboard. Yes, I have a detailed, multi-page study file, but I set it aside. I refer to it at end, to make sure I haven’t missed something I really wanted to include, but I don’t want to be directed by it in the sermon writing process. I want to prayerfully pour over the sermon text and work to express what I’ve learned in a clear, compelling way. One post remains: “Thoughts on Preaching”. This entry was posted in Preaching and tagged preaching, sermon writing, sermons on August 19, 2015 by Jason Dohm. This post assumes you have already read this, this and this. 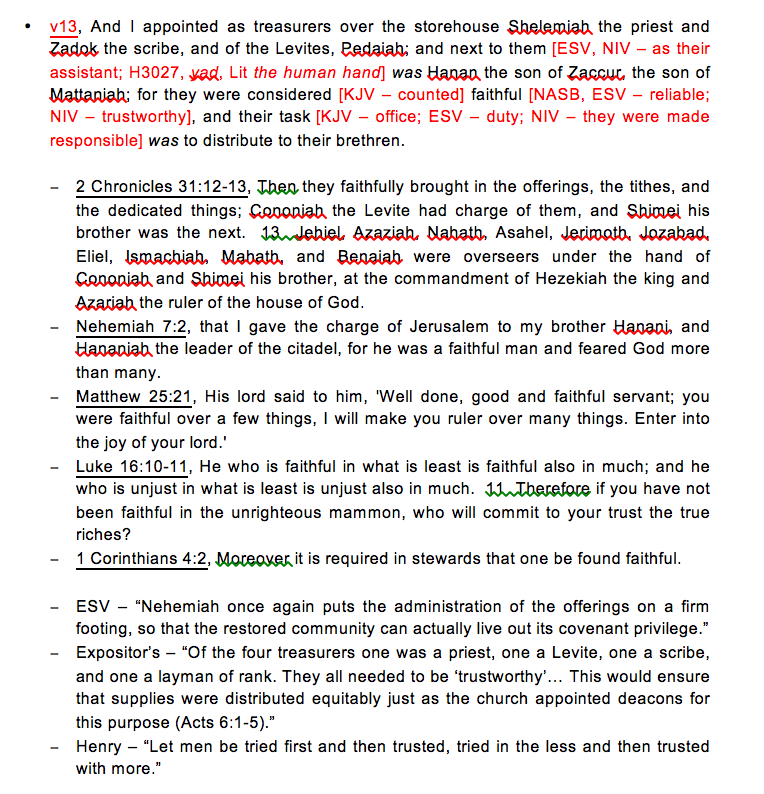 The Bible work is done, the study Bibles perused, the commentaries considered. Now I have an orderly and sometimes hefty study file. This entry was posted in Preaching and tagged expository sermon, preparing to write, sermon preparation on August 17, 2015 by Jason Dohm. The first stop on the road to preparing a sound, expository sermon should definitely be the Bible work. Once that has been given lavish attention, there is most certainly a place for consulting a variety of sources about the text. God has given tremendous insight into His word to various ones throughout the centuries, and we are well served to consult them, especially in areas of difficultly or controversy. Exclusively trusting our own insights is the height of arrogance and folly. The Reformation Heritage KJV Study Bible. Released just last year (2014), this offering by Joel Beeke and crew is a welcome addition. The notes are the most consistently Reformed of the four, and I normally benefit from the “Thoughts for Personal/Family Worship” section which concludes every chapter. The Expositor’s Bible Commentary. At the time of this post, this hardcover set (12 volumes; 8 Old Testament plus 4 New Testament) costs in excess of $500, so this is a significant investment, but there are two things I love about this set. First, it is reliably reliable. It has a wealth of information, and the viewpoints advanced are consistently sound. Secondly, it is very broad, providing visibility to even unsound viewpoints and scholarship, though only advancing what is sound. As a preacher, I need to be aware of the false interpretations being advanced by professing Christian scholars, so that I can proactively teach against these false doctrines when necessary. This commentary set also makes me aware of modern scholarship, since my preferred commentators are normally brothers from bygone centuries. Various and sundry. 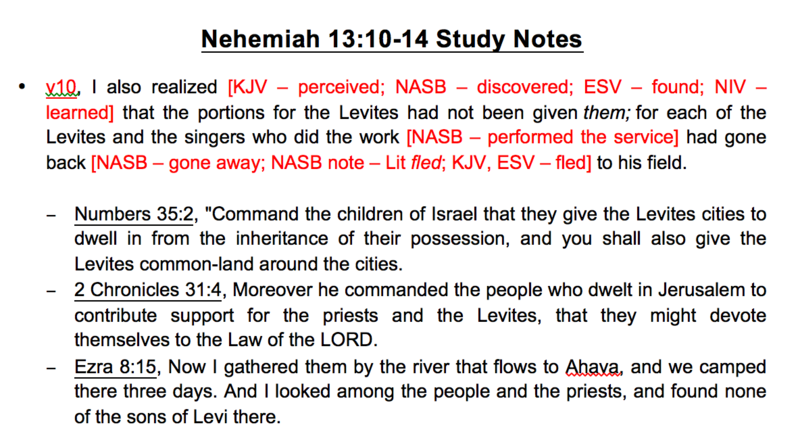 Some of the most helpful insight on a book of the Bible is not part of a Genesis-to-Revelation set. For instance, when our church was studying 1 Peter, my most beloved commentary for that became this one by Robert Leighton, which is a one-off book on just 1 Peter, not part of any set. Suggestion: Google “the best commentary for the book of _______” (fill in the blank). A number of ranking lists will pop up, and by comparing a few of them from sources you recognize and trust, you will find some great resources. Ligonier (R.C. Sproul and team) and Tim Challies often have helpful rankings. If we only use commentary sets, we will be missing some of the best available content. At this point in the process, the reading I intended to do is complete. 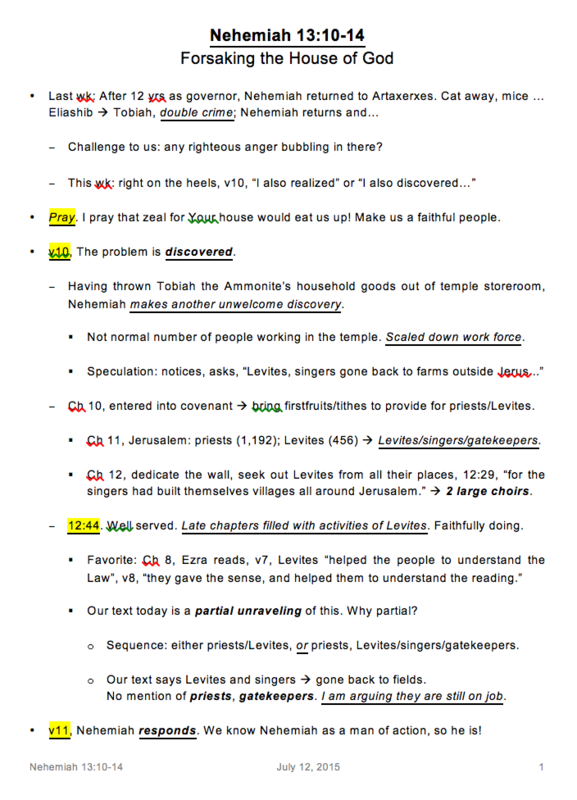 The topic of the next post will be preparation for writing the sermon. This entry was posted in Preaching on August 12, 2015 by Jason Dohm. It is a great temptation to just skip to what Matthew Henry says (for instance), but a temptation which must be resisted. What quicker way can we imagine to quench the Spirit than an unhealthy – borderline idolatrous – reliance on men? Sermon preparation should begin with a quiet room and a Bible. The most important work in preparing a sound, expository sermon happens then. Within the verse of the sermon text, I note any translational variations and/or facts about the original language in brackets and red text. In my next post, I will discuss the outside helps – the study Bibles and commentaries – that I utilize to help me better understand the sermon text. * As a side note, fantastic Bible study tools exist that are not even referenced in this post. I have not invested in these yet, but I have no doubt of their tremendous value. If you are interested, here is a detailed review of two of them. This entry was posted in Preaching, Scripture and tagged Bible work, preaching, sermon preparation on August 10, 2015 by Jason Dohm.